Sorry this has to be such a quick little post but I wanted to let you know that Kim Hupke, Education Director for Spellbinders Paper Arts is going to be on HSN tonight (Tuesday) and tomorrow morning (Wednesday), please see the schedule below. So set your DVR or VCR to record it, you won't want to miss a minute!! Kim will be showing the Wizard Die Cutting and Embossing System and some of the amazing die templates from Spellbinders. 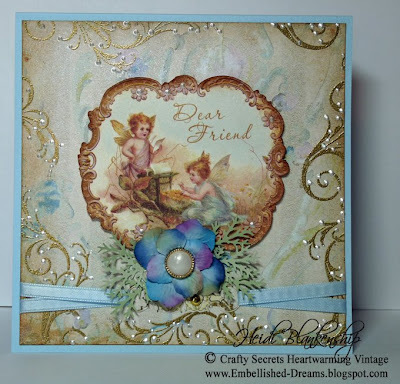 You will also get to see samples of art work from the Spellbinders Design Team! For today's project I created something that would make a really fun gift or it could be something decorative to display in your kitchen and it's oh so yummy too! Who doesn't love pasta? 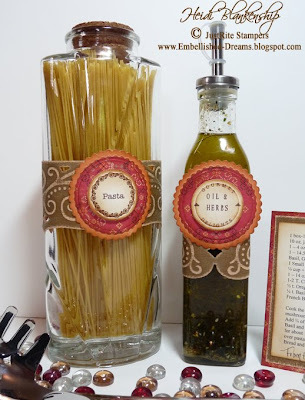 Well, I know my family does and today I am going to share one of our favorite pasta recipes with all of you and a fun way to display your pasta and oils. Here is the project I made. This was a very easy project to do and it really dresses up the containers. 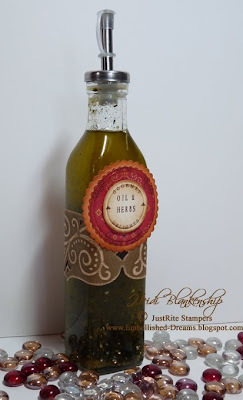 I started out with the oil & herbs bottle, using the 1-3/16'' Wood Stamper along with the Recipe Border & Centers Set and the Times New Roman 15 pt. Font from JustRite Stampers I created the center and border. As you can see in the picture below I trimmed the border so I would only have the words Gourmet Delights. Here is a close up of the stamps. For the center circle diecuts I used the Standard Circles Lg. S4-114 die templates from Spellbinders along with the Wizard and Classic Cream cardstock. I stamped using Tsukineko Memento, Rich Cocoa Ink and then I inked the edges with Distress Ink, Vintage Photo from Ranger. Then I used Honey Pie, Cosmo Cricket Designer Paper for the Standard and Scalloped diecut. I used the Standard Circles Sm. S4-116 and Petite Scalloped Circles Lg. S4-115 die templates from Spellbinders along with the Wizard to make the diecuts. To make the decorative band around the center of the bottle I used some Core'dinations cardstock from The Chocolate Collection, with an orange/peach core color and the Heirloom Scroll Border Grand S7-013 die template from Spellbinders along with the Wizard. 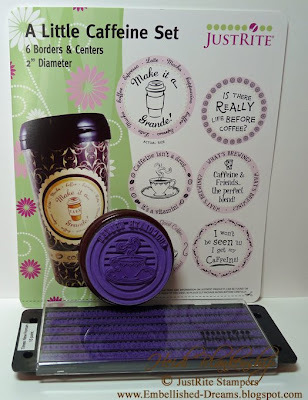 The Core'dinations cardstock from The Chocolate Box Collection is so yummy, I love all of the rich brown colors! Once I cut and embossed the border then I sanded all of the edges and embossed areas to reveal the core color and really make the embossing pop. Just as a little note, you will be able to see from all of the photos I used the same paper and inks on each of the projects. 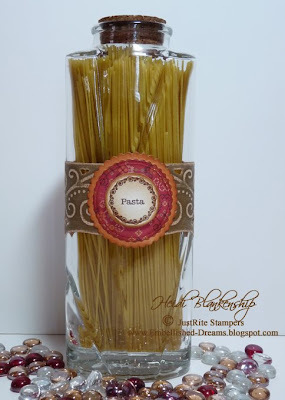 Here's a couple pictures of the stamps I used to make the tag for the pasta. For the stamp I used the center from the Recipe Borders & Centers Set which I trimmed so I could just use the word Pasta and then I used a border from the Tiny Words Borders & Centers Set along with the 1-3/16'' Wood Stamper. Here's a close up of the stamp. 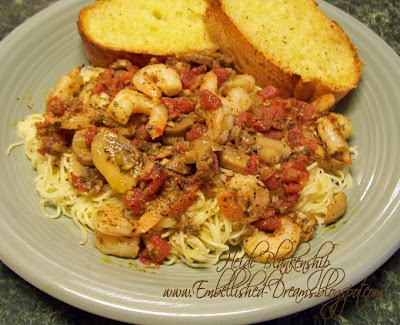 Here is the recipe card for the Pasta and Shrimp. You can see a close up of the stamp in one of the pictures above. 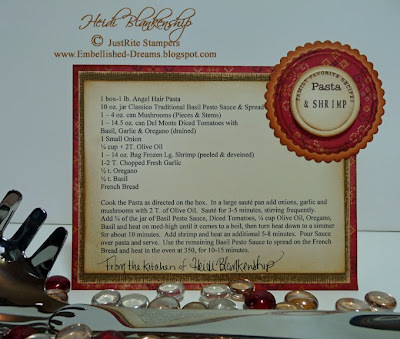 For the recipe card I used the 1-3/16'' Wood Stamper along with the Recipe Border & Centers Set and the Times New Roman 15 pt. 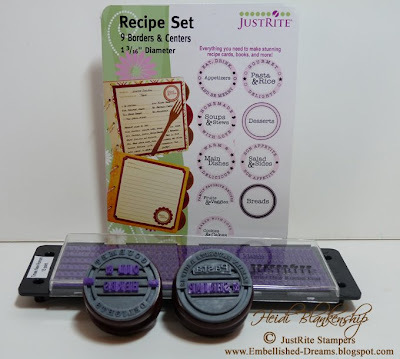 Font from JustRite Stampers. 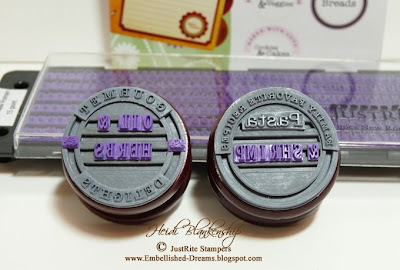 My favorite thing about the JustRite Stampers is being able to mix and match with the stamps and make the perfect stamp for your project. I typed up the recipe on the Classic Cream cardstock and then I used Core'dinations and Cosmo Cricket papers to make the mat. Here's a picture of the Pasta & Shrimp. Also if any of you would like to try this yummy dish here is the recipe. Cook the Pasta as directed on the box. In a large saute pan add onions, garlic and mushrooms with 2T. of Olive Oil. Saute for 3-5 minutes, stirring frequently. Add 3/4 of the jar of basil Pesto Sauce, Diced Tomatoes, 1/4 c. Olive Oil, Oregano, Basil and heat on med-high until it comes to a boil then turn heat down to a simmer for about 10 minutes. Add shrimp and heat an additional 5-8 minutes. Pour sauce over pasta and serve. Use the remaining Basil Pesto Sauce to spread on the French Bread and heat in the oven at 350 for 10-15 minutes. Other~Spellbinders-Wizard, Standard Circles Lg. S4-114, Standard Circles Sm. S4-116, Petite Scalloped Circles Lg. 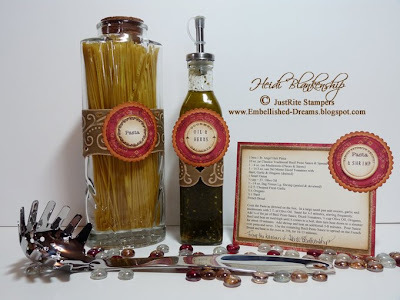 S4-115, Heirloom Scroll Border Grand S7-013 die templates, Sanding block, Cotton Balls, Bottles, Pasta, Oil & Herbs. Thank you so much for stopping by today! Check back soon as I have been given a wonderful blog award & I am happy to pass on the award to some very talented friends. 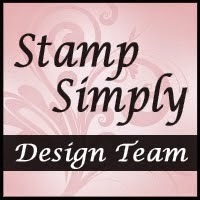 I hope you have a wonderful day and don't forget to check out the JustRite Stampers Blog and Gallery where I know you will find many beautiful designs to inspire!! As I mentioned in my last post over the weekend we went to WI and my cousin Dani and her husband Shawn had their baby girl baptized and then after the baptism we had a luncheon at their home and then the baby shower. It was a wonderful day and most of our family was able to be there. A Fantastic way for Dani to have her 1st Mother's Day! Here is the card that I made for them. 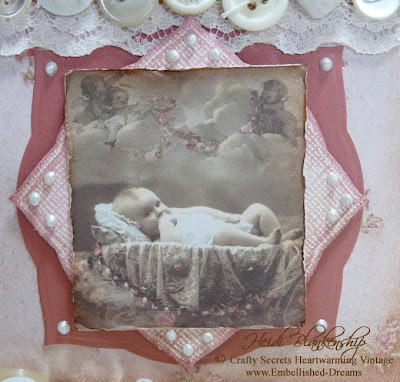 I just love the image of the baby with the little cherubs up above with garlands of flowers. Here is a close up of the image. The image is from The Joys of Life booklet from Crafty Secrets. The Joys of Life booklet has so many wonderful pictures from Childhood, School Days, Weddings & Babies just to name a few. The booklet is filled with so many beautiful pictures for all the special events in our lives. I cut out the image, distressed and inked the edges using Vintage Photo Distress Ink from Ranger. To make the mat behind the image I used the Labels Three S4-189 die template along with the Wizard from Spellbinders to cut and embossed the diecuts. For the top label diecut I used some cardstock from Core'dinations, the Whitewash Collection. I love the look you get after sanding the cardstock and the color core pops through. 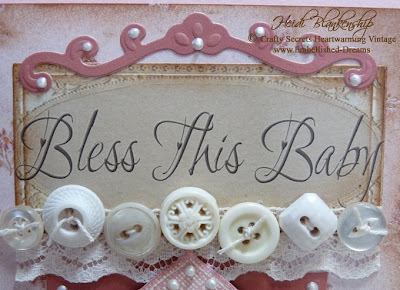 The sentiment, Bless this Baby also came from the Joys of Life booklet from Crafty Secrets. I used the Long Classic Rectangles Sm. S4-144 die template to make the diecut. I inked the edges with Vintage Photo Ink and then added some lace and vintage buttons along the bottom. The flourish diecut on the top was made using the Flourish Accents S4-198 die template. On the side of the card I used the same Core'dinations cardstock and the Classic Lace Border Grand S7-014 die template from Spellbinders to make the gorgeous lace diecut. I think the Classic Lace die template is one of my favorites! I love all of the detail and it can be used with almost everything. I also added a piece of pink velvet ric-rac to cover up the edge of the diecut and I thought the velvet trim gave it a softer look. 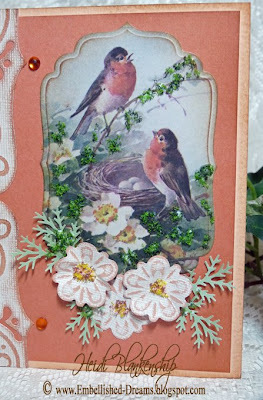 The background paper is designer paper from The Robin's Nest, it has dainty little flower bouquets. 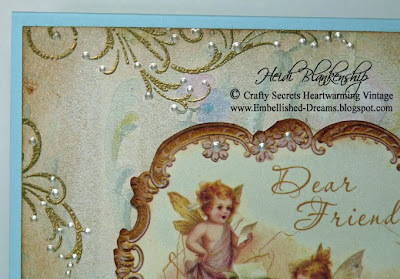 I also added tiny little drops of liquid pearls for accents on the card. Here is a picture of the inside of the card. The Congratulations stamp is from the Cherish stamp set from Crafty Secrets and I added a little color to the flowers with Copic markers. Here is another picture so you can read the sweet little poem I found online. You can also click on all of the photos to enlarge them. Thank you so much for stopping by and I hope you have a terrific day!! Today is the beginning of a new week, the sun is shinning and it looks like it's going to be a Beautiful day!! I hope all of the Moms out there had a Wonderful Mother's Day and enjoyed time with their families. We had a really nice day yesterday. We went to WI for a baptism and a baby shower. One of my Cousins and her husband had their first child, a sweet little baby girl, about a month ago and since they live a little ways away decided to combine the baptism and shower all on the same day. I made a baby card for them that I will share a little later this week but for today I want to share the card that I made for my mom for Mother's Day. Here is the card that I gave to my Mom for Mother's Day. I was very happy with how it turned out and I love the flowers and the border on the side. 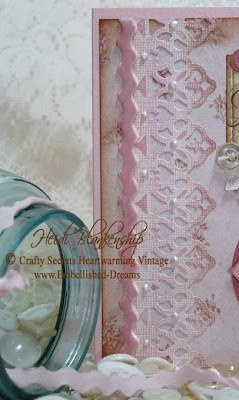 The border was made using the Heirloom Scroll Border Grand S7-013 from Spellbinders. I also love how the flowers I made perfectly match the flowers in the image. The flowers were made using one of the flower die templates from Flower Bouquet S4-200 and the Wizard from Spellbinders along with some beautiful paper from Core'dinations, Whitewash Collection. The core color is kind of an orange and terra cotta mix and goes very nicely with the color from the images of the birds. After I made the the diecuts of the flowers then I sanded them to make the core color pop. I also added some ferns around the flowers and some Flower Soft. If you haven't ever used Flower Soft it is a really fun product to work with. It's easy to use and it adds so much dimension to your projects! For the center of the flowers I used some Flower Soft that is my own mix (Sunshine Yellow, Baby Peach and Nut Brown) and then for the greens I used another mix (Shamrock Green, Christmas Green). I really like the two greens mixed together and it gives it a more natural look of nature, because thing in nature are not all on color. 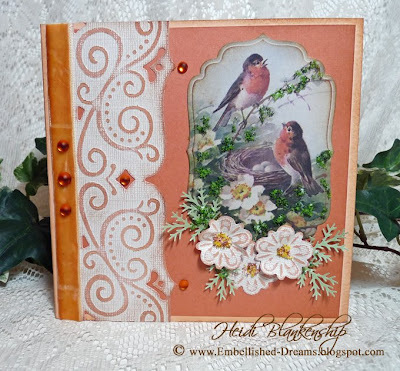 The image of the birds is from Crafty Secrets, Birds & Botanicals Images and Journal Notes. All of the images in the booklet are just amazing! They are so beautiful and the detail to each image is unbelievable! 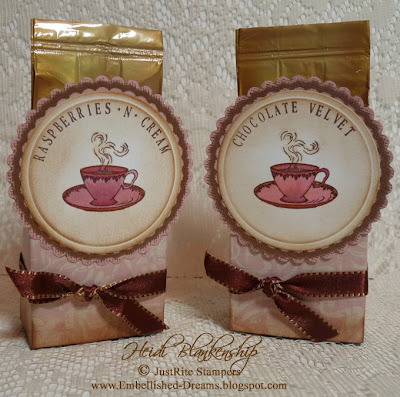 I used the Labels Four S4-190 die template from Spellbinders to cut and emboss the image. I also added some beautiful velvet ribbon on the side and a little bit of bling. Thank you so much for stopping by today and I hope you have a Marvelous Monday! On a more personal not I wanted to say, I love you Mom and I hope you had a Happy Mother's Day!!! 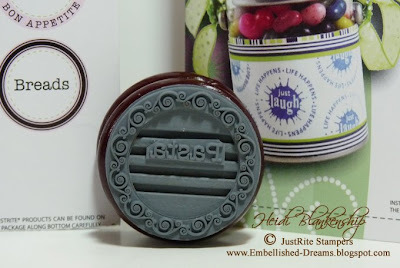 Today, JustRite Stampers is having a Blog Hop to celebrate the second CHA stamp release! I am very excited to see what all of the ladies on the JustRite Blog Team have created for today's blog hop!! Below is a list of all the Design Team Members so you can be sure to check them all out. Also one of the Design Team Members has some sweet blog candy!! 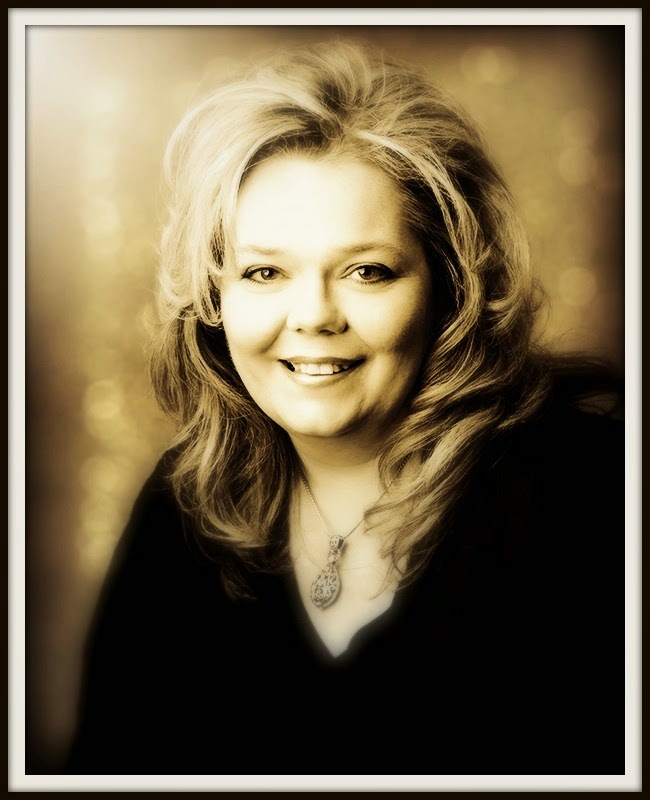 I want to give a warm welcome to Michele Kovack, our new Blog Design Team Member!! 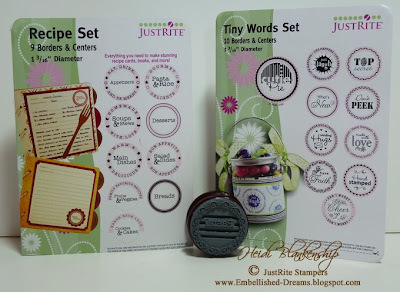 You will want to check out the JustRite Stampers Blog, this past week they have been showing sneak peeks from Stamper's Dream. Also you can see all of the #2 Releases on the JustRite Website, click HERE to check out all of the New Products. Today's post is a little long but I have lots of pictures to share with you so grab a cup of joe, sit back, relax and enjoy! 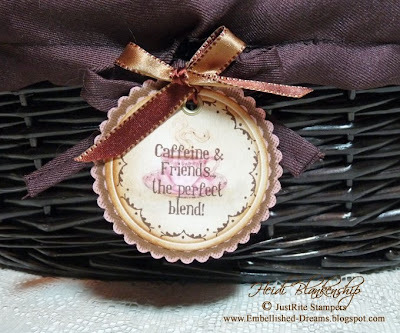 To create my project I used several of the centers and borders from the Newly Released "A Little Caffeine" stamp set from JustRite Stampers along with the Times New Roman 15 pt. Font. 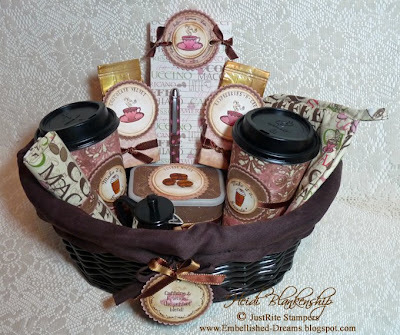 I have to say I had so much fun creating all of the little goodies in the coffee basket! But before I get started showing you the project I want to show you a picture of all the items I used in the basket and what they looked like before I altered them. 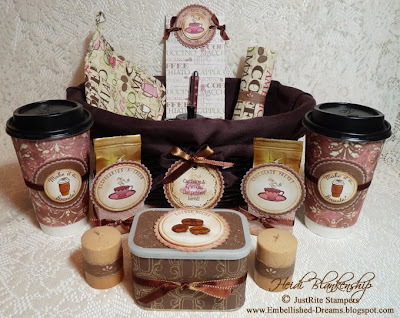 I like being able to take several inexpensive things and alter them for really nice gift sets. Now here is a picture of the finished gift basket. I started with the coffee cups. I wanted to alter them and I needed a template so the easiest thing to do was take one of the cups apart and I made a template from the cup itself. Once I had the template then I traced it onto some designer paper from My Mind's Eye. 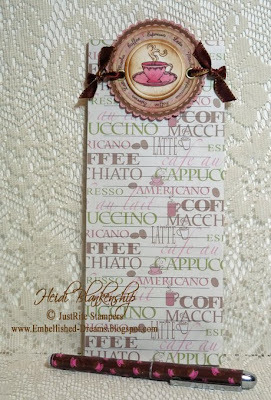 I adhered the designer paper and then I stamped the "Make it a Grande" center from the A Little Caffeine stamp set onto white cardstock using Tsukineko Memento, Rich Cocoa ink. 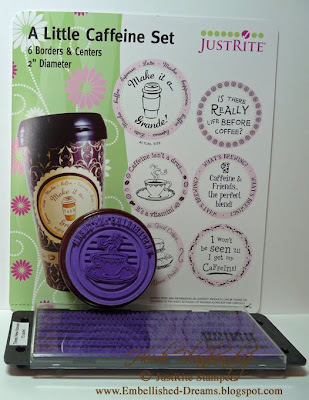 Then I used the Wizard, die cutting and embossing tool along with my Nestabilities, Standard Circles Sm. S4-116 to cut and emboss a circle diecut. 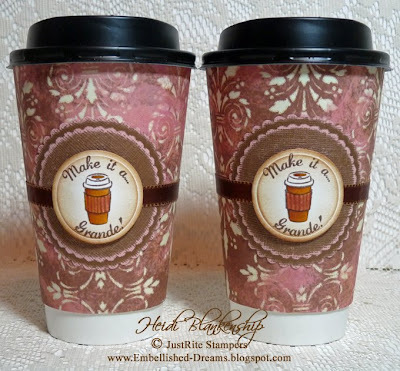 Then I colored the cup using Copic markers and inked the edges with Vintage Photo Distress Ink from Ranger. 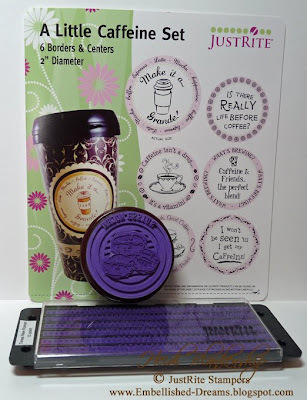 I also made a scalloped circle diecut using the Petite Scalloped Circles Sm. S4-117 Nestabilites. To do the scalloped circles I used some Core'dinations-The Chocolate Box Dark Pink/Chocolate cardstock and sanded the edges. Then I added some ribbon going around the center of the cups and added the die cuts. I also wanted to mention that I used the same two colors of ink Tsukineko Memento, Rich Cocoa and Vintage Photo Distress Ink from Ranger along with Copic markers throughout the entire project. 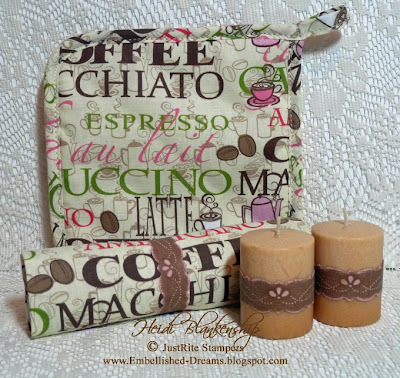 Next I made little sleeves to cover the two small bags of coffee. For the sleeve I used some BellaBella designer paper from My Mind's Eye and inked the edges. I also used another center from A Little Caffeine stamp set along with the Times New Roman 15 pt. Font. Here's a couple of pictures showing how the font is lined up and you can also see from the pictures I have trimmed the centers too. I have had several people ask about lining up the fonts and I have found for myself that if I write out whatever my sentiment is and then find the center that is a really good starting point. I start with the center at the top of the block and then work off of each side. Here is a picture of the notepad, for this I used a center and a border from the A Little Caffeine stamp set and the Times New Roman 15 pt. Font. To get the layered effect I used two different sizes of the Circle Nestabilities Standard Circles Lg. S4-114, Standard Circles Sm. S4-116 and the Petite Scalloped Circles Sm. S4-117 Nestabilities. The notepad already had two holes on each side at the top so I added the gold eyelets to the topper and tied it on with some ribbon. 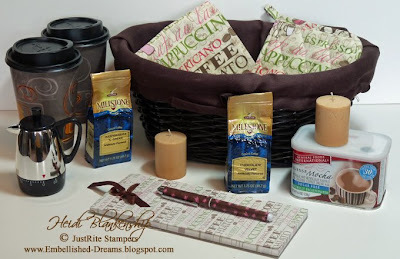 To dress up the towel and the candles I made bellie bands using the Victorian S4-167 border die template from Spellbinders along with Core'dinations cardstock and sanded it to reveal the colored core. 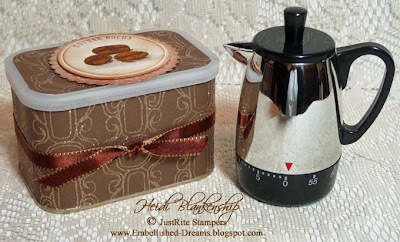 To cover the tin with the coffee mix I used some designer paper from ChatterBox, Fine Tinsel Chocolate. I thought the little coffee pot timer was so cute! 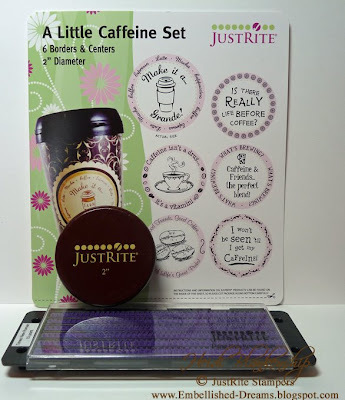 Then I used the coffee beans center from A Little Caffeine stamp set with the Times New Roman 15 pt. Font. 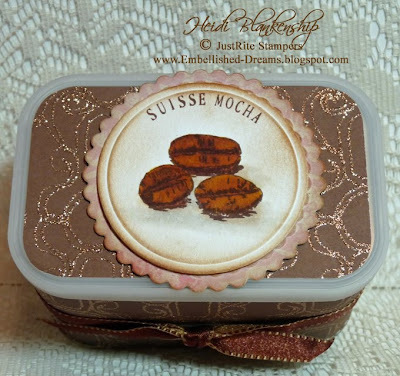 Here is a close up of the top of the tin. Are you still hanging in here with me? I told you it was a long one *wink*. The last thing I did was to create a tag for the basket. This one was a little tricky but I was really careful and managed to line it up on the first try! First I stamped the center with the sentiment and the border and then using the same ink I stamped off the coffee cup on some scratch paper and then lined it up and stamped over top of the sentiment. I added an eyelet and tied the tag onto the basket with some ribbon. 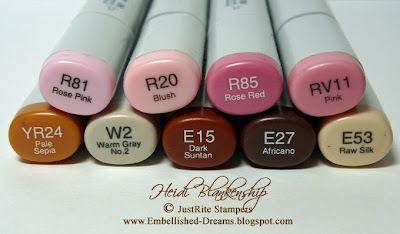 Thank you so much for stopping by today and I hope that you enjoy the JustRite Blog Hop!! 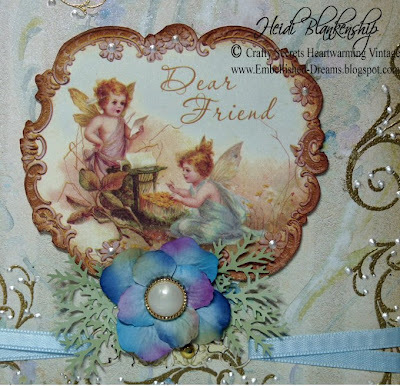 Today's card is one that I created using Girlfriends, Creative Scraps from Crafty Secrets. 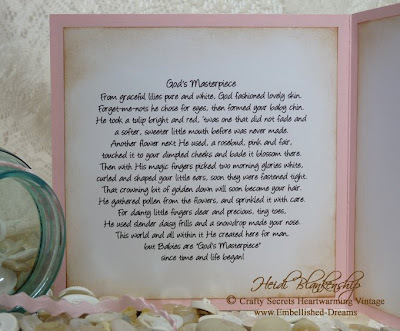 I love the New Creative Scraps from Crafty Secrets! The Creative Scraps are available in 6 different themes and they are loaded with so many beautiful vintage images, there really is something for everyone. The main image on the card is from the Girlfriends, Creative Scraps. I cut out the image and inked the edges with Vintage Photo, Distress Ink from Ranger and then used pop dots on the back to add some dimension. Below the image I added some light blue ribbon that is held in place with stickers and gold brads. 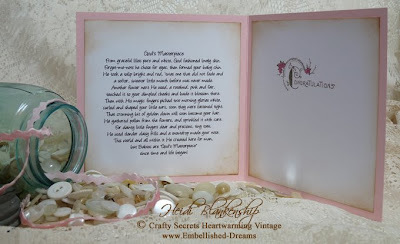 The stickers are from the Greetings & Sentiments Sticker Sheet from Crafty Secrets. Then I added a prima flower and some ferns that I made using a Martha Stewart punch and I added a pearl and gold button to the center of the flower. 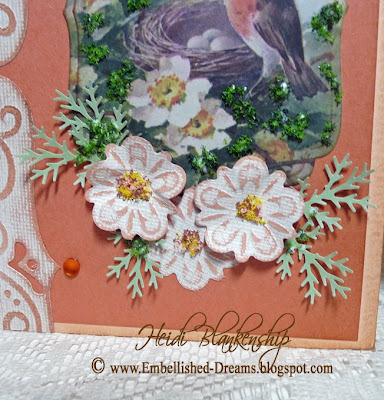 The background paper is from the Pastel Designer Paper Pad from Crafty Secrets and I used a flourish stamp from the Cherubs Stamp set from Crafty Secrets and gold embossing powder. Then I inked the edges of the designer paper with Vintage Photo, Distress Ink from Ranger and added Liquid Pearls to accent the flourishes. Thank you so much for stopping by today and I hope you have a great day and a wonderful start to your week!